What is P265GH? Grade P265GH is the Heat Resistant Pressure Vessel Steels defined in the EN 10028 system. It is a non-alloy steel. The material is designed for high temperature applications. Therefore it is mostly utilized in high temperature applications in the oil and gas sector, chemical processing industries and petrochemical sectors. It is a main fabricating material of boilers and pressurized vessels. It is normalized by keeping it against a temperature of 890 to 950°C without holding; the heating is passed on through the thickness of the plate. What is EN 10028? P265GH is identified in the standard EN 10028. It is a European material standard for “Flat products made of steels for pressure purposes”. Moreover the standard covers “Non-alloy and alloy steels with specified elevated temperature properties”. The standard was published in the year 2009. Why P265GH called A516 grade 60 Steel? P265GH is the designation alloy in the European standard, also referred as A516 grade 60 in ASME/ASTM standards. Many manufacturers claim to be compliant with both specifications of EN 10028 and ASME/ASTM material A516 grade 60 steel. 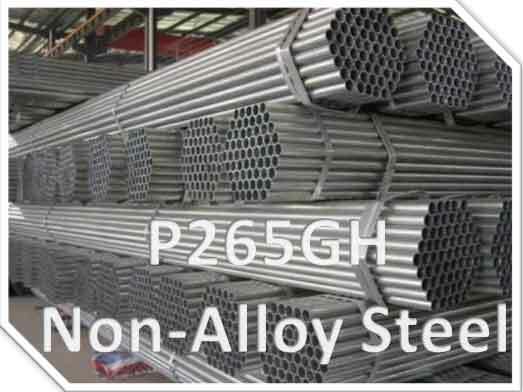 Available Forms in Market: P265GH steel is a carbon non-alloy steel made for critically making into wrought products. It is typically available in the market in the normalized condition. P265GH is the EN chemical designation. Dimensional Characteristics of P265GH Steels: The applicable thickness for this P265GH material as obtained by online statistics in the market starts from 1.50 mm to 12.5 mm defending upon processes. However the width of this material varies and it is available in slit width of 100 mm and over. The mill edge width starts from 900 mm width to 1880 mm. Maximum percentage of Carbon (C) is 0.20. The tensile strength of the ASTM 516 Grade 60 alloy steel is expressed in Newton per millimeters and it must be at-least 410 N/mm2 (MPa) and at-most 530 N/mm2 (MPa). The elongation property of P265GH steel varies with the treatment and thickness but it is indicated typically greater than 22%. Yield strength should be equal to or greater than 255 N/mm2 (MPa). In DIN standard, the corresponding material is referred as 1.0425 type steel. In British BS standard, the corresponding material is referred as 161 430A type steel. Supplier Salzgitter Flachstahl GmbH bearing contact number +49 (0) 5341 21-2890. Supplier Yusheng(Group) industrial Co.,Ltd. bearing contact number 0086-371-60380543. The supplier address is East Area,25thFloor,Y.H.International Plaza, Zhengzhou City, Henan province in China.